We don't like to play favourites, but there are two high-street stores that are strides ahead of the game here in the UK, and they're undoubtedly in competition with each other: Mango and Zara. Both are now just as fast as the other onto the latest trends (from the street and the catwalks), and both can surprise and delight us with hidden gems in-store and online. There are few things we relish quite as much as bringing you the most impressive buys from each of these Spanish megastores, but it's not that often we hold the two up against each other to contrast and compare. So with the start of the spring/summer 2017 season just around the corner (HURRY UP! ), we thought it a good idea to trawl these the brands' new-in sections to see the most important trends that they're behind, how well they're doing them and where is best for you to place your hard-earned moola this month. Without further ado, keep reading to see the best new-in pieces from Zara and Mango. All we can say is good luck deciding what's best—it's no easy task! 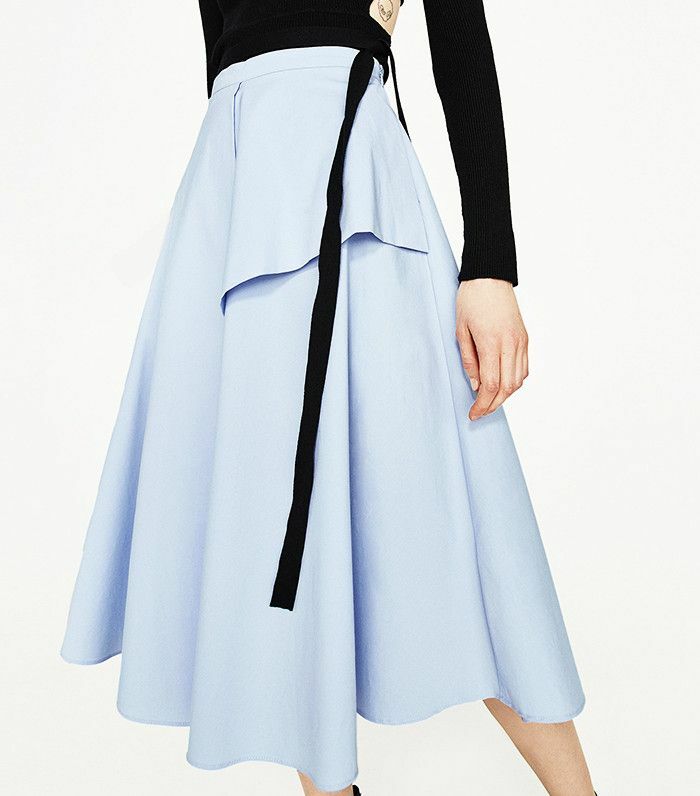 Balletic and easy to wear in colder weather with black knitwear, this flattering skirt has many plus points. We'll be bookmarking this summer-friendly piece to wear later this year, but there's no way we'll let it sell out first. Zara has inspired us to layer a corset-style belt over a coat—and red with black looks particularly striking. This has just sold out—but you can add it into your wish list; we're crossing fingers for its return. Now this is how to wow your colleagues—just look at that volume! Based on the matching sweater that has been tremendously popular, you can jump onto the statement-sleeve trend via cardigans, too. There are almost no words for how great these are: perfect for real magpies. If you like the idea of this shoe trend but want to be subtler, this is the pair for you. This blouse has everything going for it—one-shoulder styles are going to be big news for 2017. This does the '90s layering for you and quietly nods to spring's dark floral trend. Flattering and very of-the-moment, this is one bargain you won't regret. If you haven't gotten your head around kitten heels yet, opt for slip-on golden loafers instead. This is potentially quite basic, but when layered up with tailoring, it brings a great sportif twist. When it comes to this year's take on sport-luxe, the more retro the better—which this provides by the bucketload. Next up, ultra-cool street-style outfit inspiration to see you through the next month.